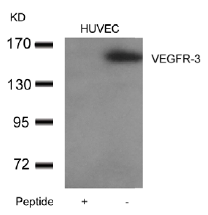 Recombinant human soluble Vascular Endothelial Growth Factor Receptor-3 (sVEGFR-3/FLT-4) was fused with a carboxy-terminal 6X histidine-tag. All three VEGF receptors belong to the class III subfamily of receptor tyrosine kinases (RTKs) characterised by the seven immunoglobulin-like loops in the extracellular domain. The expression of VEGFR-1 to -3 is almost exclusively restricted to hematopoietic precursor cells, vascular and lymphatic endothelial cells and to the monocyte/macrophage lineage. They play key roles in vasculogenesis, hematopoiesis, angiogenesis and lymphangiogenesis. The FLT-4 cDNA encodes a 1298 amino acid (aa) residue precursor protein with a 23 aa residue signal peptide. Mature VEGFR-3/FLT-4 is composed of a 751 aa residue extracellular domain, a 22 aa transmembrane domain and a 482 aa residue cytoplasmic domain. 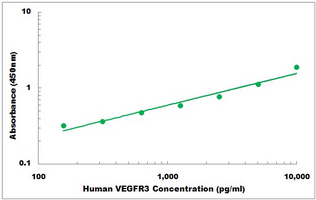 Both VEGF family members VEGF-C and VEGF-D have been shown to bind and activate VEGFR-3/FLT-4. The Flt-4 gene is widely expressed in the early embryo but becomes restricted to the lymphatic endothelial a latter stages of development. It is important for lymphangiogenesis. 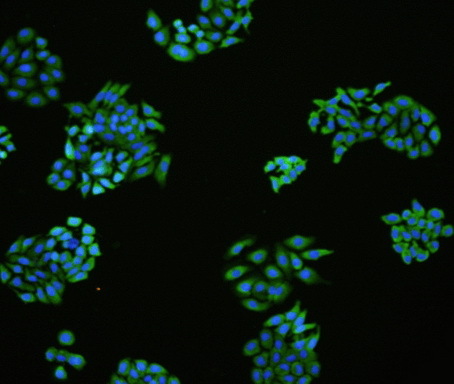 Immunofluorescence staining of human VEGFR-3/FLT-4 (red) in hFlt4-transfected MG63 cells. 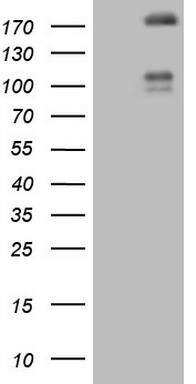 Monoclonal mouse anti-human FLT-4 clone 9D9 (Cat.-No DM3512P) and polyclonal rabbit anti-human FLT-4 (D) Cat.-No DP3511: A and C are negative control with secondary antibody only; B (mAb) and D (pAb) with specific antibodies against human FLT-4. The experiment was performed by the research group of Dr. Wolfgang Holnthoner, Ludwig Boltzmann Institute for Experimental and Clinical Traumatology, Austrian Cluster for Tissue Regeneration, Donaueschingenstrasse 13, A-1200 Vienna, Austria. 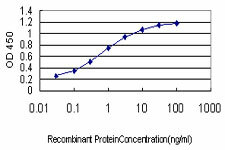 Western analysis of recombinant Human soluble VEGFR-3/FLT-4. FACS analysis with HDMVEC and HUVEC. 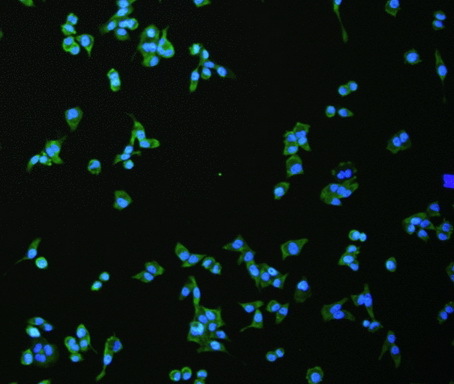 FACS analysis with primary human dermal lymphatic endothelial cells (HDLEC). 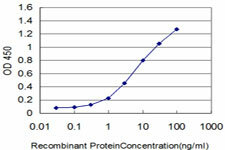 Detection limit for recombinant GST tagged FLT4 is approximately 0.03ng/ml as a capture antibody. 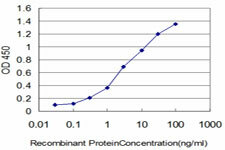 Detection limit for recombinant GST tagged FLT4 is approximately 0.3ng/ml as a capture antibody. 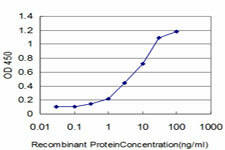 Detection limit for recombinant GST tagged FLT4 is approximately 0.1ng/ml as a capture antibody. 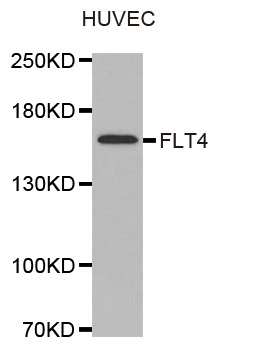 FLT4 monoclonal antibody (M04), clone 5B5. 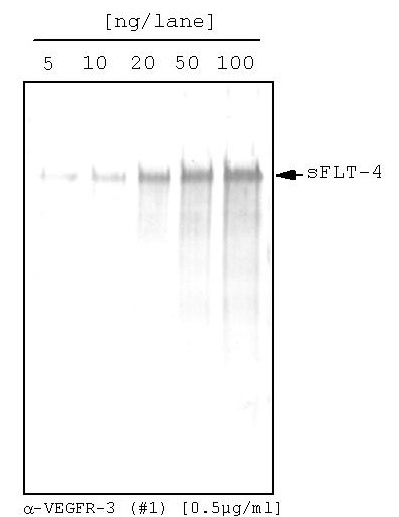 Western Blot analysis of FLT4 expression in MES-SA/Dx5 ( Cat # L021V1 ). 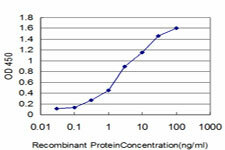 Detection limit for recombinant GST tagged FLT4 is approximately 1ng/ml as a capture antibody. Figure 2. 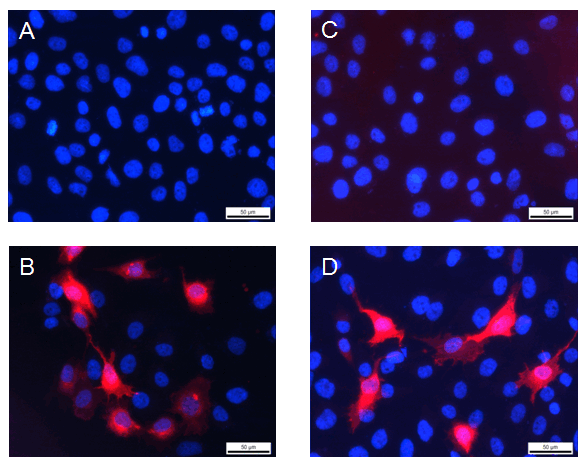 Formalin-fixed and paraffin-embedded human lung carcinoma tissue reacted with VGFR3 Monoclonal Antibody (Cat.#AM11070PU-N), which was peroxidase-conjugated to the secondary antibody, followed by DAB staining. This data demonstrates the use of this antibody for immunohistochemistry; clinical relevance has not been evaluated. Figure 1. 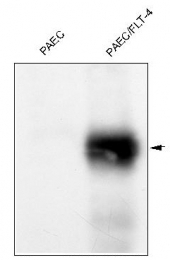 Western blot analysis of anti-VGFR3 Monoclonal Antibody (Cat.#AM11070PU-N) by VGFR3 recombinant protein(Fragment 50KD). 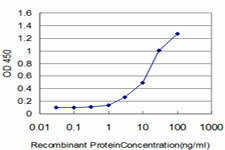 VGFR3 protein (arrow) was detected using the Purified Mab. 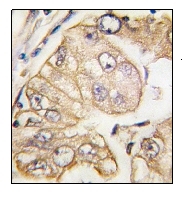 AP15558PU VEGFR-3/Flt-4 antibody staining of Human Placenta. 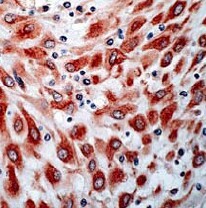 Immunohistochemical staining of FLT4 on formalin fixed, paraffin embedded human placenta with FLT4 polyclonal antibody. 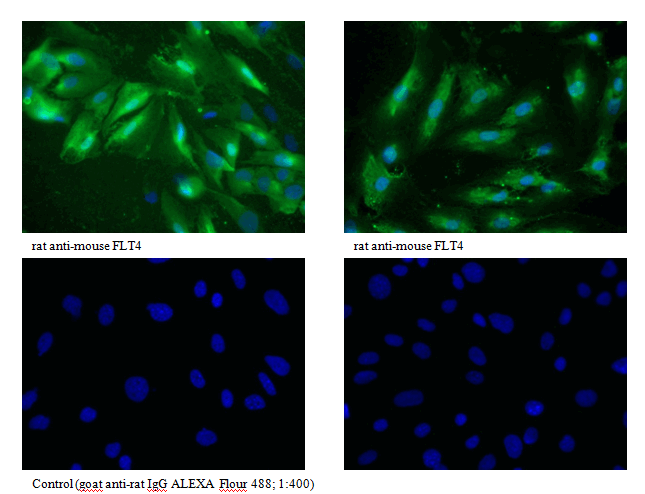 Immunofluorescence staining of VEGFR-3/FLT4 in Mouse primary endothelial cells (SnoMec) with monoclonal Rat anti-Mouse VEGFR-3/FLT4 #7A3 Cat.-No AM20378PU-N (upper panel). Control with goat anti-rat ALEXA Flour 488 (lower panel). Western analysis with anti-Mouse VEGFR-3/FLT-4 antibody DM3505P at 5 µg/ml (Lysate of 2x10e6 cells). 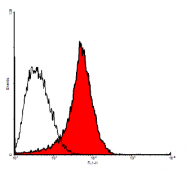 Western analysis of recombinant human soluble VEGFR3/FLT-4 using a Mouse anti-Human FLT-4 antibody (Cat.-No AM20379PU-N). 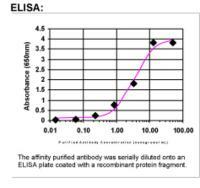 Sandwich-ELISA using recombinant human soluble FLT-4 as standard (Cat.-No DA3535). 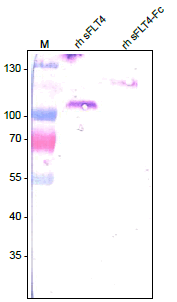 Mouse anti-Human FLT-4 Antibody Clone 2E11 (Cat.-No AM20379PU-N) was used as capture antibody, Biotinylated rabbit anti-Human FLT-4 was used for detection. 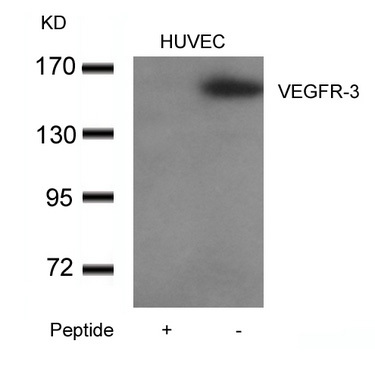 Western blot analysis of extracts from HUVEC cells using VEGFR-3 Antibody AP26050PU-N and the same antibody preincubated with blocking peptide. Western blot analysis using FLT4 antibody Cat.-No AM06464SU-N against FLT4(AA: 25-330)-hIgGFc transfected HEK293 cell lysate. 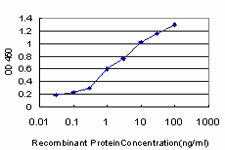 HEK293T cells were transfected with the pCMV6-ENTRY control (Left lane) or pCMV6-ENTRY FLT4 (RC214285, Right lane) cDNA for 48 hrs and lysed. 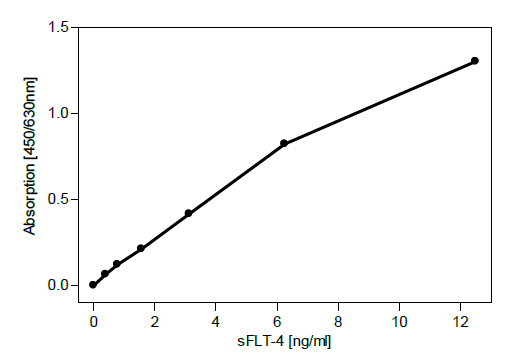 Equivalent amounts of cell lysates (5 ug per lane) were separated by SDS-PAGE and immunoblotted with anti-FLT4. Western blot analysis of extracts of HUVEC cell line, using FLT4 antibody.